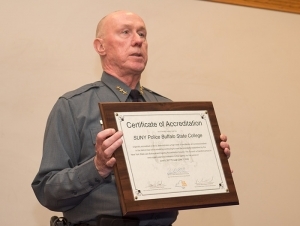 Members of the University Police Department, the department itself, and two other college departments were honored at an awards ceremony on February 7. College President Katherine Conway-Turner was on hand to extend her congratulations and to praise UPD for its commitment to community policing and the many ways they embrace a community policing philosophy. The University Police Awards Committee awarded the SUNY Police Chief’s Association 2017 Professional Award to Assistant Chief Amy M. Pedlow and Officer Edward A. Helling. Pedlow was recognized for conducting a comprehensive program to ensure the highest degree of compliance with the Clery Act at Buffalo State. Helling was recognized for establishing the “Adopt a Hall program” to increase partnership between students living in first-year residence halls and University Police.